IQ's Corner: "Intelligent" intelligence testing with the WJ IV Tests of Cognitive Ability #2.5: What is Kaufman's "intelligent" intelligence testing? 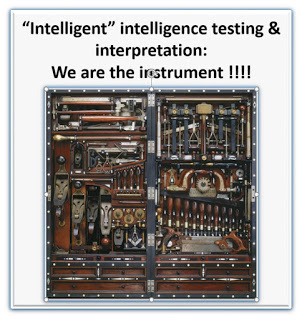 "Intelligent" intelligence testing with the WJ IV Tests of Cognitive Ability #2.5: What is Kaufman's "intelligent" intelligence testing? This should have been one of the first posts in my "intelligent" testing series. Better late than never. Alan Kaufman's 1979 "Intelligent intelligence testing with the WISC-R" had a profound impcat on my intelligence testing practices when I was a practicing school psychologist and in many ways influenced my career to move into applied psychometrics, scholarship, etc. If you prefer a PDF copy, with one slide per page, it can be found here.